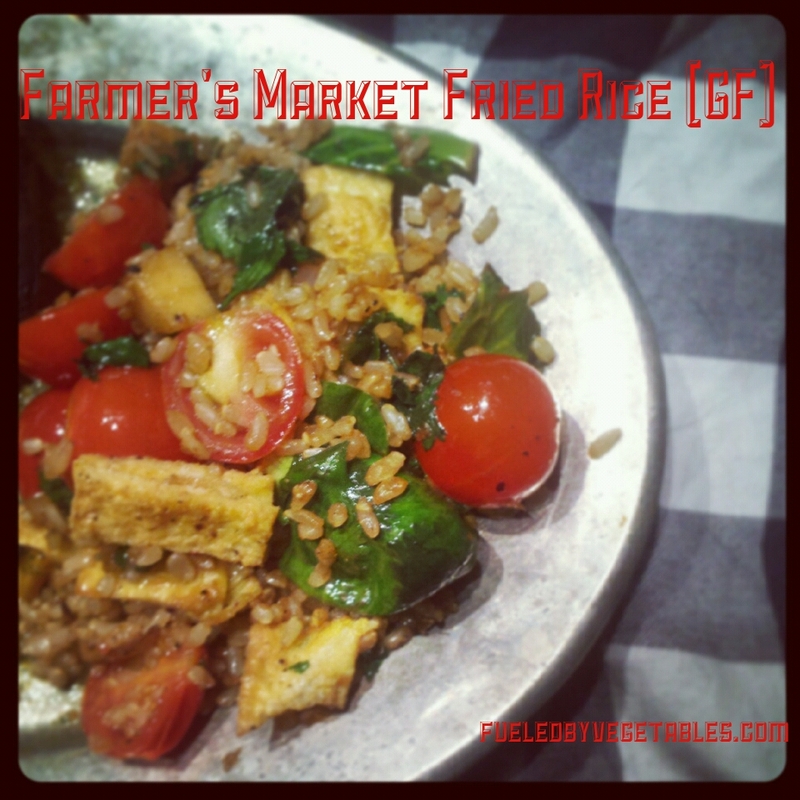 I had a TON of veggies in the fridge that needed to be used up – and I was craving a rice dish. Cutting out pasta seemed like a nightmare to me, but the fact that I can still eat most of things I’m addicted to (rice, quinoa, etc.) made this diet change seem a little less daunting. Not to mention that I found affordable gluten-free pasta at market down the street ; I’m going to try this tonight, hopefully it’s not too much of a difference than the real stuff. 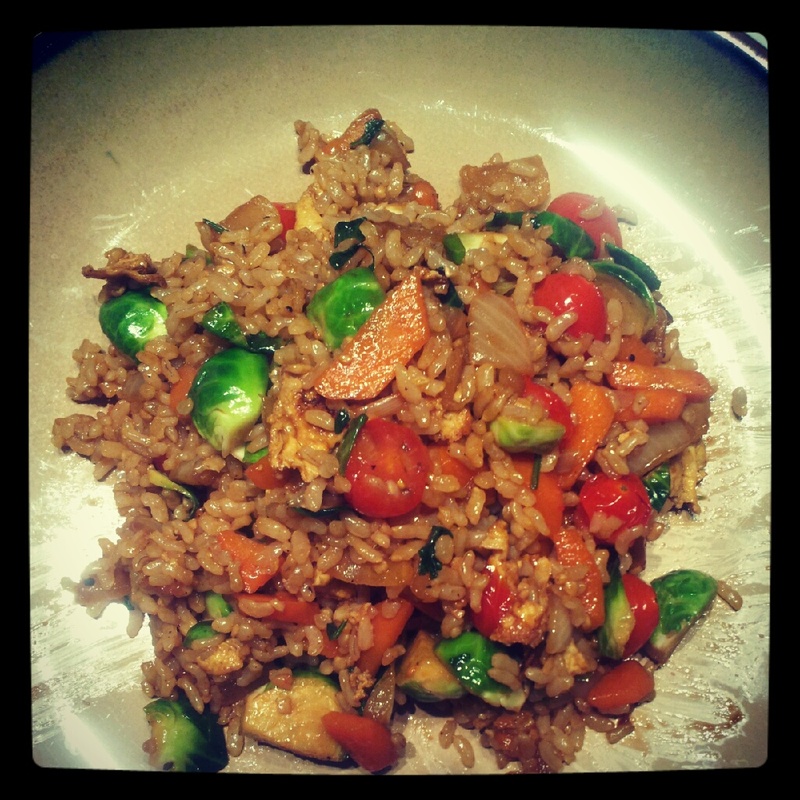 Back to our meal last night, I had brussels sprouts, carrots, tomatoes and cilantro – so I decided to make a dish similar to the Farmer’s Market Fried Rice that I wrote about in previous post. I should also mention that since I’m gluten intolerant – I can’t have regular soy sauce anymore. 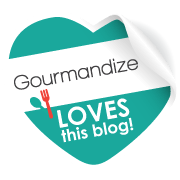 Luckily for me and gluten-free readers, Kikkoman has come out with a gluten-free soy sauce that is delicious! 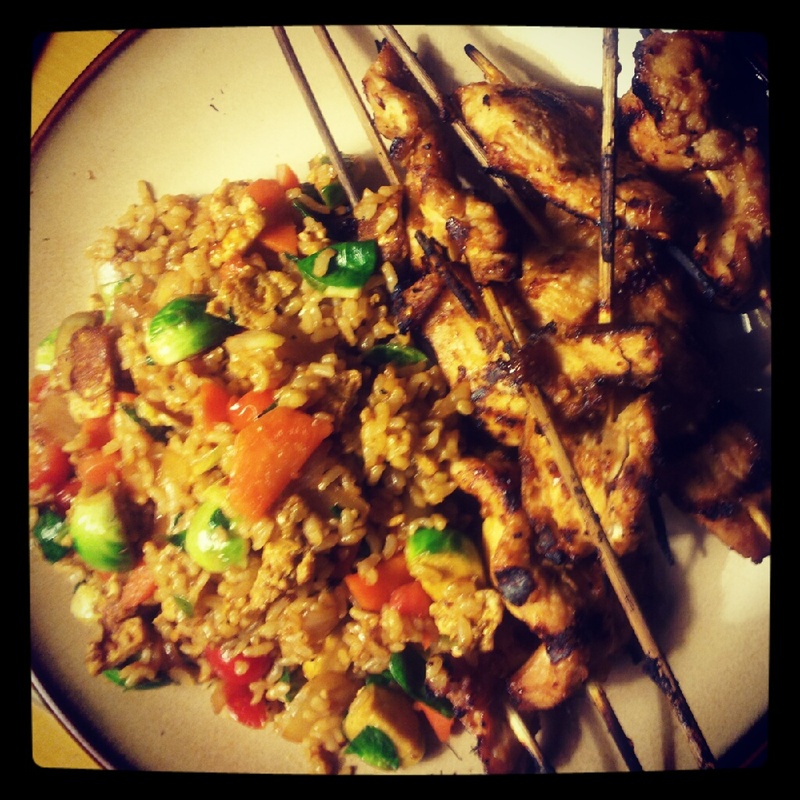 This was the bulk of my dish last night – I made Nick Chicken Satay to pair with his rice. Swirl 1 tablespoon oil into the wok, add garlic and shallots and stir-fry, using a metal spatula, until fragrant, 10 seconds. Add carrots and Brussels sprouts, reduce the heat to medium-high and stir-fry until the vegetables are nearly cooked through, about 2 minutes. Swirl in the remaining 1 tablespoon oil, add rice, tomatoes and soy sauce and stir-fry, breaking up the rice, until heated through, 2 minutes. Sprinkle with cilantro, salt and pepper; add the egg pieces and toss to combine. Excuse me for my absence… got a lot going on in FBV land :). I didn’t really do much cooking over the weekend – Nick was busy working and I got a glorious weekend all to myself. I literally got nothing done – NOTHING. But some weekends are made for doing nothing, right?? In the spirit of not lifting a finger at all this weekend, I decided to order in on Friday AND Saturday… I never do that! Any who, I was feeling a bit inspired yesterday – not too inspired since this dish only took about 20 minutes to make haha. 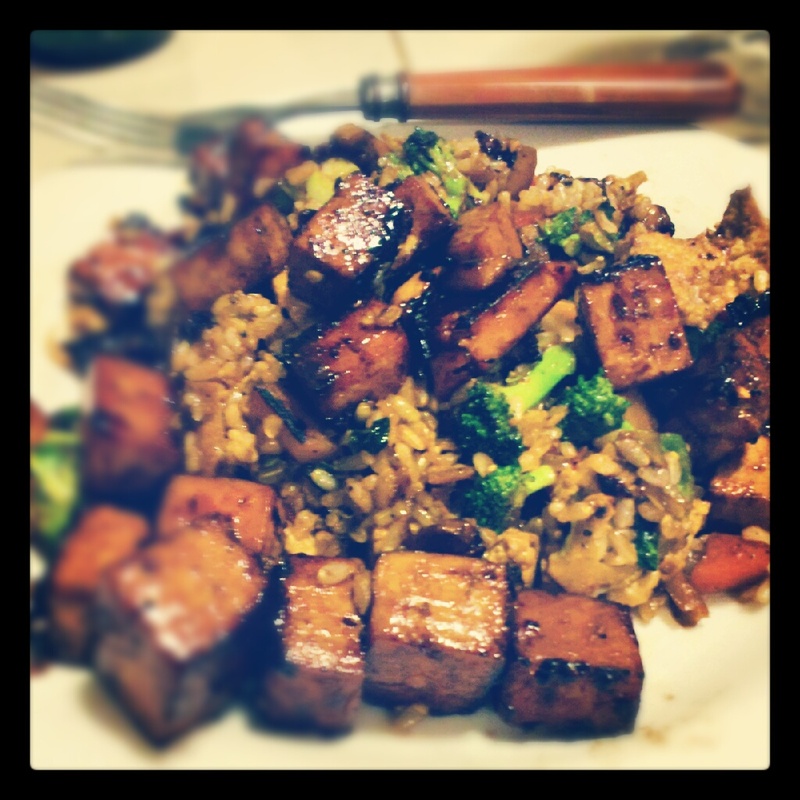 I was inspired by my favorite dish at Pei Wei (judge me if you want, but some of their dishes are irresistible) known as Mongolian Tofu. My version didn’t turn out exactly like you get in the restaurant, but was still yummy. With Nick’s we just pan-fried some chicken in place of the the tofu… and mushrooms – Nick hates mushrooms. Remove it from the heat and dip the tofu pieces into the cornstarch to apply a very thin dusting to both sides..
Let the tofu sit for about 2 minutes so that the cornstarch sticks. Heat up one cup of oil in a wok (you may also use a skillet for this step as long as the beef will be mostly covered with oil) over medium heat and add tofu and mushrooms. Saute for 5 minutes. 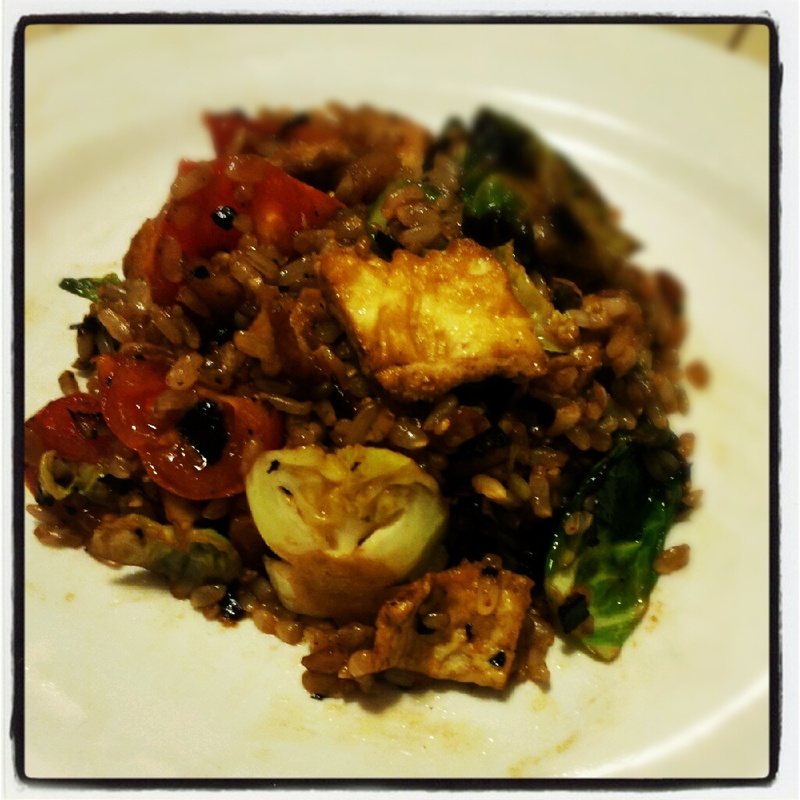 Cook for one more minute, then remove the tofu, mushrooms and onions with tongs or a slotted spoon to a serving plate. Serve over rice. I LOVE quinoa. Nick hates it. Well – hate is a strong word, so let’s just say it’s not his “favorite.” My cooking mantra is: If it doesn’t taste good, put cheese on it. Most of the time, this mantra works… especially in this case. If you love mac n’ cheese but want to make it a little healthier by adding protein and cutting carbs, then this recipe is for you. I paired it with some savory grilled tofu (Nick made chicken with the same marinade) and my Crispy Lemon Roasted Brussels Sprouts. TDF. Lightly saute garlic and shallot over medium heat. Preheat oven to 350 F. Coat 13×9 inch dish( or 8 individual ramekins) with cooking spray.Whisk together eggs and milk in large bowl. Fold in quinoa mixture and cheese. Stir very well and let some of the cheese melt. Transfer to prepared baking dish and if using Panko Crumbs or Bread crumbs add now and bake 30-35 mins, until bread crumbs are browned. Remove tofu from package and drain. Meanwhile, mix all the other ingredients together in a shallow bowl. After the tofu is done draining, slice into 3/4 inch thick strips. Place slices in the marinade and allow to site for at least 10 minutes. While the tofu is marinading, heat an indoor grill pan (or outdoor grill) to medium heat. Grill tofu for 3 minutes on each side. Place the baking sheet into the oven and roast for 40 minutes. 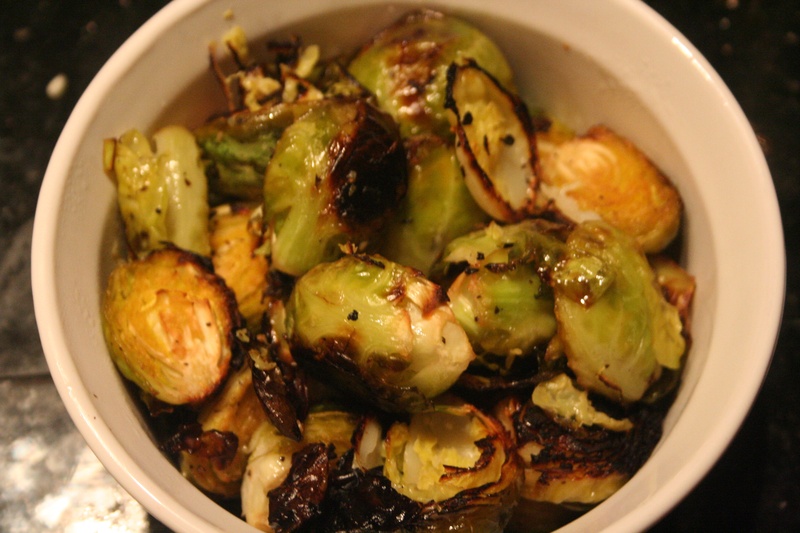 Remove the baking sheet every 15 minutes while roasting and give the Brussels sprouts a good toss to make sure they are evenly roasting and browning. 10 minutes before they are done, squeeze an entire lemon on top of the vegetables and then cut the remaining lemon up and throw it onto the baking sheet and place back into the oven to finish roasted. Once the edges are crisp and brown, remove the baking sheet from the oven and sprinkle with cheese. Taste and adjust seasonings if needed. Serve immediately.